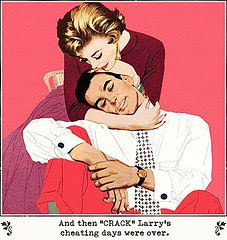 Monday Pick Me Upper: CRACK!!! I like your blog, gave me inspiration. Could always say it was an accident, she was only trying to adjust his neck pain...hehe.. Thanks for visiting Multibrand. Glad to have inspired you. Thanks for dropping by. That cartoon is really funny, isn't it?